The First Trilogy of Van Allen Plexico’s Superhero Novel Series—At Last in a One-Volume Edition! (August 8, 2012) White Rocket Books proudly announces the release in trade paperback format of Van Allen Plexico’s SENTINELS: THE GRAND DESIGN, a one-volume collection of the first three novels in the famed cosmic superhero saga! Weighing in at a whopping 624 pages and with a stunning painted cover by celebrated artist Mitch Foust, the “Grand Design” Omnibus also features no fewer than fifteen full-page interior illustrations by series artist Chris Kohler. The book contains all three volumes of the first Sentinels trilogy (When Strikes the Warlord, A Distant Star, and Apocalypse Rising) in their entirety, introducing the heroes and villains (and those in between) that make up this fascinating and compelling superhero universe. What begins as an attempted abduction of a young student from her college campus quickly spirals out to engulf a diverse collection of individuals, including billionaire inventor and hero-wannabe Esro Brachis, beloved national savior (and amnesiac) Ultraa, wisecracking daredevil Damon “Cavalier” Sinclair, and mysterious alien powerhouse Vanadium. Can this motley crew come together as a team in time to save the Earth from conquest or destruction? Through the eyes of central character Lyn Li, a Chinese-American teen that possesses amazing electromagnetic powers, we encounter aliens and androids, geniuses and demigods, megalomaniacal arch-villains, space-borne monsters, and everything else one would expect from a classic Bronze-Age comic series—in New Pulp novel form! White Rocket Books is a leader in the New Pulp movement, publishing exciting action and adventure novels and anthologies since 2005, in both traditional and electronic formats. White Rocket books have hit the Amazon.com Top 15-by-Genre and have garnered praise from everyone from Marvel Comics Vice-President Tom Brevoort to Kirkus Reviews. Eldest child of her world’s ruling dynasty, Aria is also the daughter of the evil Black Sorcerer—one of the dreaded First Men of Mars—and has been imbued with his sorcerous might. Rebelling against her father’s tyranny, Princess Aria has joined forces with a human soldier and a savage Mock-Man, and now dares to challenge the First Men’s rule. Will Aria’s power be enough to tip the balance in John Blackthorn’s favor, and free her world—or will she betray the rebels to her father—or worse—and bring all they have fought for crashing down? 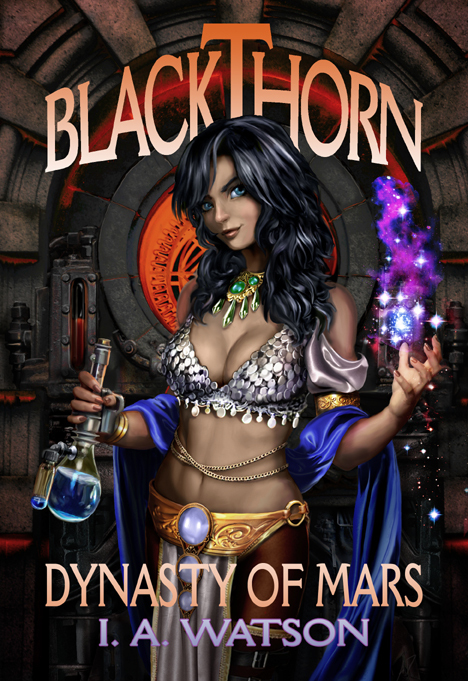 BLACKTHORN: DYNASTY OF MARS, by award-winning author I. A. Watson (Robin Hood; Sherlock Holmes) and with a spectacular cover painted by Adam Diller, takes the saga of John Blackthorn and his brave companions to the next level—and beyond—with a grand adventure stretching down the centuries and across the war-torn face of post-apocalyptic Mars! On sale as of July 28, 2012, BLACKTHORN: DYNASTY OF MARS is a $15.95, 6×9 format trade paperback from White Rocket Books, and a $2.99 e-book for Kindle. I. A. Watson and Van Allen Plexico joined Ric Croxton for a special episode of the Book Cave, discussing all things BLACKTHORN– characters, stories, backgrounds and influences–and the new BLACKTHORN novel coming soon from Watson and White Rocket Books, among many other interesting topics. Adam Diller has held a wide variety of artistic positions within the video game industry, ranging from Concept and Production Artist through to Art Director, and has worked on everything from apps to RPGs to third-person shooters for the latest gaming consoles. When the realization hit that he hadn’t had the opportunity to draw nearly as many Martian Princesses as he would have liked–and despite being in high demand for his beautiful artwork–he became an easy mark to recruit for BLACKTHORN. The result is a gorgeous painting of Princess Aria, destined to grace the cover of I. A. Watson‘s Blackthorn: Dynasty of Mars— coming very soon from White Rocket Books! BLACKTHORN: Spires of Mars–Serial Novel by I. A. Watson–begins NOW at WhiteRocketBooks! BLACKTHORN: SPIRES OF MARS Online Serial Adventure! Continuing the Adventures of the Award-Winning New Pulp Warrior and his Allies! (July 11, 2012) A young man desperate to save his sister from the raiders who kidnapped her into slavery… An ancient undead released after half a millennium… Four sorcerous First Men who will kill half a world to keep their darkest secret… And three champions who will stand for Mars against horror and tyranny—or die trying! Award-winning author I.A Watson’s online novel set in the futuristic Martian world of BLACKTHORN offers readers a serial adventure in the tradition of old-time pulps, showcasing the vibrant characters and lush settings of this popular and successful series. 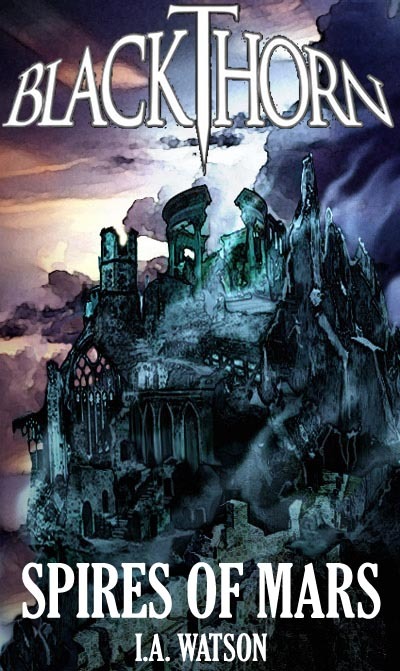 Join Earth General John Blackthorn, Princess Aria of Mars, Oglok the Mock-Man and an ever-expanding cast of rebels, monsters, magicians, and villains as the mystery of the ancient Harmony Spires is explored. Following on from BLACKTHORN: THUNDER ON MARS and meshing with the upcoming BLACKTHORN: DYNASTY OF MARS novel, also by Watson, this stand-alone full-length serial adventure offers a glimpse of a future where magic and technology are one and humanity must face its ultimate challenge. Jump in on the ground floor at www.whiterocketbooks.com/blackthorn with Chapter 1: “A Night in the Deadlands.” A desperate young man must cross the wasteland where everything dies – but nothing stays dead! Tune in for new chapters every Monday and Thursday! White Rocket Books is a leader in the New Pulp movement, publishing exciting action and adventure novels and anthologies since 2005, in both traditional and electronic formats. White Rocket books have hit the Amazon.com Top 15-by-Genre and have garnered praise from everyone from Marvel Comics Editor Tom Brevoort to Kirkus Reviews. Ian Watson Visits the Nocturne Travel Agency; Talks BLACKTHORN! Meet Van Allen Plexico’s SENTINELS! A ragtag band of mutants, aliens, androids, gods, and mere mortals all banded together against the most dreaded menaces of all–these are the SENTINELS! In the days to come, their creator, Van Allen Plexico, will introduce us to the team (and their deadliest foes) one by one, here at Pulp Cosmic. In the meantime, you can discover how the team first came together–and somehow avoided killing each other!–by picking up the first volume of the six-books-and-counting saga, WHEN STRIKES THE WARLORD! Get it for Kindle and Kindle apps for only $2.99 here! Get it for Nook and other e-reader here! Get it in trade paperback here!